A house deserves to be lived in. It deserves to feel like your own little sanctuary. Close the door behind you, and forget about the outside world. Enjoy time with the family, unwind after a long day, and – most of all – love the space you’re in. That’s what makes a house a home. I love to create things for the home, and turn my four walls into a personal space. It’s your own small part of the world to call home, why not make it special? In this post, I’m going to take you on a journey through the various tricks and techniques you can use. By the end, I hope to fill you with countless creative ideas! You can even add to the list yourself by giving me some tips of your own. Use the comment section to let your creative juices flow! Without further ado, here at the many, many ways you can turn your house into a comfortable, lovely home. I love to experiment with colours throughout the house. A simple tin of paint is all it takes to give the home an entirely different feel and ambience. This can be done with painting the walls, furniture, or just by using colourful soft furnishings. Bold accent walls help create a statement, but having a basic white wash on your walls gives you a blank canvas. 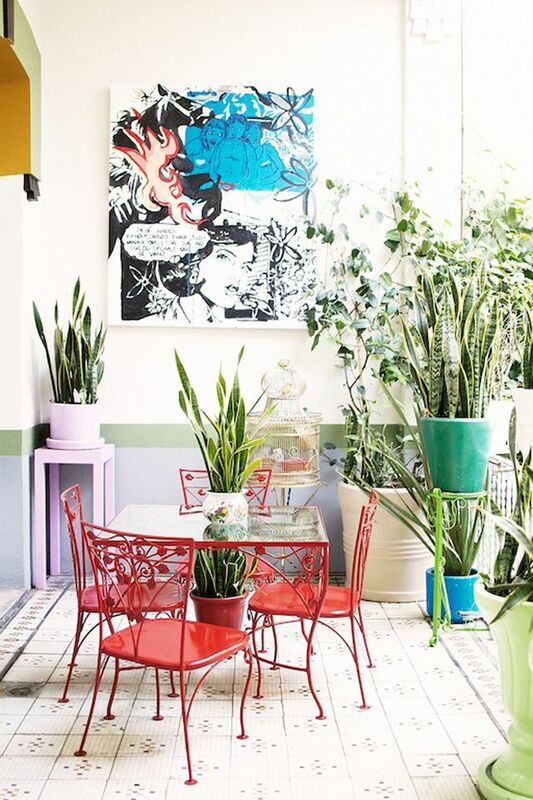 This is great if you have bright furniture, which really stand out against the blank white walls! Also great if you rent! A house becomes a home when you fill it with your personal experiences and memories. Take this opportunity to place photos of your travels and explorations around the house. We are all a product of our life experiences, and everyone is unique in that way. By translating those experiences to your home, you create a space that is uniquely yours. Use family heirlooms and trinkets picked up on your travels to decorate the space. Frame an old letter from a relative, and fill the home with photos and memories. In a similar vein, let your personality shine through all over the house. If your passion is music, pay homage to that with your decoration. Try framing your favourite records or creating a bookshelf full of old vinyl. Let a piano take centre stage in your living room, and put your record player or stereo in pride of place. You can do the same with books, and turn the house into a library. Whatever your passions, personality, or hobbies, let them shine through. Creating a home is all about feeling comfortable in your own space. 4. Make your own rules! If you’re anything like me, you’ve probably scanned hundreds of interior design magazines. You’ve read all the blogs, and tried to follow the latest trends. But, I realised the truth about interior design: there are no rules! You don’t need to follow the latest trends to make your house a home, you’ve just got to do what feels right for you. Forget what the magazines are telling you. Choose the colours you love. Don’t worry about clashing or mismatching furniture either. It’s all about your own style. For me, a house becomes a home when you fill it with blankets, cushions, and throws. A good rug always works wonders too. These soft furnishings help add texture and warmth to the entire house. It softens the harsh and sharp edges, and gives everything a softer touch. You can also snuggle into them at the end of a long day, and feel at peace with the world! Forget the flat-pack furniture, and let’s head off the beaten track. Visit a flea market or find a vintage furniture store. Find unique items that have a history. Choose chairs and tables that are full of character and personality. A little wear and tear means they’ve had a good life, and they’ll keep serving you well! You can do the same with rugs and soft furnishings. Find things that no-one else has! This is easiest trick in the book, guys! Lots of greenery instantly brings a house to life. It breathes some fresh air into the room, and injects a burst of colour. My advice is make friends with the local florist or flower market sellers. Visit them every few weeks, and pick up something fresh for the house. Greenery softens up cold spaces like bathrooms and kitchens, while flowers bring life to your bedrooms and lounge areas. So simple, but so effective. Interior designers rarely reveal their secrets, but one thing I know for sure is they always use clever lighting tricks. The lighting will entirely change and shape the ambience and feel of your house. My number one priority is installing dimmer switches in your overhead lights. A bright overhead light is just too much, especially in the winter. I like to create a cosy, soft glow instead. You can then set up small task lights (like lamps and spotlights) around the room. Finally, use candles to decorate the room with flickering light. Perfect! Your house is never going to feel like a home if it has a funky smell! You want your home to smell delicious and fragrant. Choose your favourite scented candles and diffusers, and dot them around the house. Make a habit of lighting them every day, and making that smell a part of your family home. A cold house is never going to feel like a home. It will always have that chill in the air, and you’ll never feel comfortable. That’s why I always put home heating at the top of my repairs list. A smart home heating and cooling system is a joy to live with! In the winter, I can crank up the thermostat, and get cosy with the family. In the summer, I can bring the temperature down with the cooling system. You’ll never feel at home if you can’t get the temperature right. If you’re lucky enough to have a back garden, then treat it well! It’s a wonderful luxury to have some grass and a small patio area. You can let the kids run free, while you enjoy some time out in the sun. Try to keep the lawn trimmed every couple of weeks, and make sure the flower beds are kept in check. Invest in some good-quality garden furniture, so you and the family can sit out on a summer evening. It gives the house a bigger sense of space, and it’s a great way to entertain guests. You should be able to enjoy and indulge yourself in your own home. Don’t feel guilty about filling the house with your own personal pleasures. Take the plunge, and buy the expensive quilt and bedding. Install jacuzzi jets into the bath, and get yourself a heated mat for the bathroom. It’s these little luxury touches that give you a warm fuzzy feeling in your own home. If you love gaming and films, treat yourself to a big-screen TV and sound system. Stop feeling guilty in your home, and indulge yourself. We all have different daily routines and lifestyles. Make sure your home adapts to that, and helps out. Your house will never feel like a home if it doesn’t suit your lifestyle. If you’ve got a lots of children who all need feeding before school, make sure your kitchen is big enough. If you work from home, create a practical space for working. Make changes that suit your daily routine and lifestyle. If the house feels like it’s working against you, you’ll never relax! A house starts to feel like a home when you can show it off to your family and friends. When you fill it with people and life, the house seems to adopt its own personality. You start to feel proud of it too. Make memories, throw a dinner party, and play with the kids. You need to give life to the house if you’re hoping to turn it into a true home. Phew! That was a long one, guys. But, thanks for sticking with me, and I hope I inspired you! Have you got any fantastic ideas you can share with me and the readers? This entry was posted in Home Decor on February 1, 2016 by Sophie.